– We have changed our free trial period for new users from 7 DAYS TO 30 DAYS. We want you to have ample time to implement the software and see its value. – We added advanced Lead Ads Field Mapping. 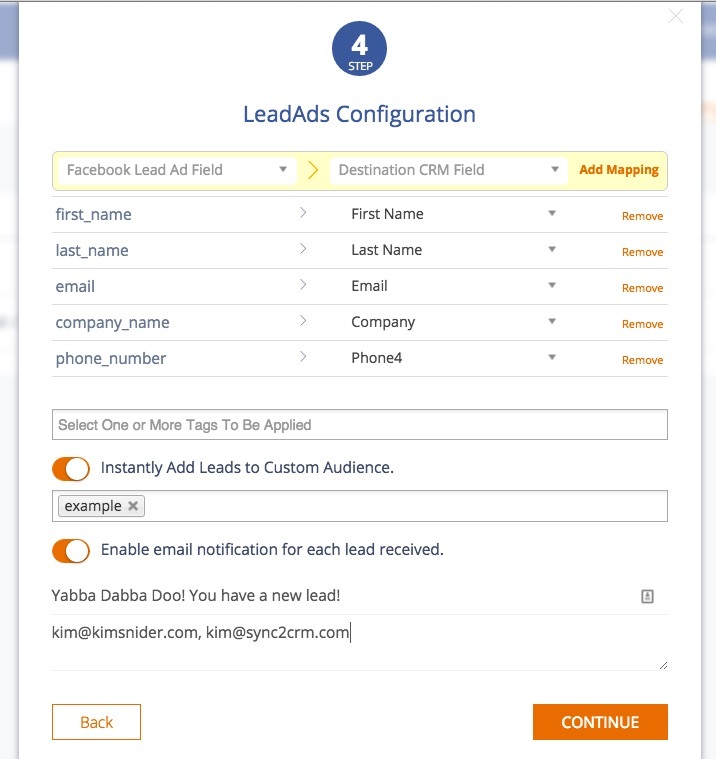 Now you can put data from any field on a Facebook Lead Ad form in any field in your Infusionsoft app so you can QUALIFY LEADS and create TARGETED CAMPAIGNS based Lead Ad inputs. – We now store your most recent data map as the default for that page so each time you connect a new lead ad you SAVE TIME by not having to re-enter the same mapping. Just add any new fields or change the defaults. 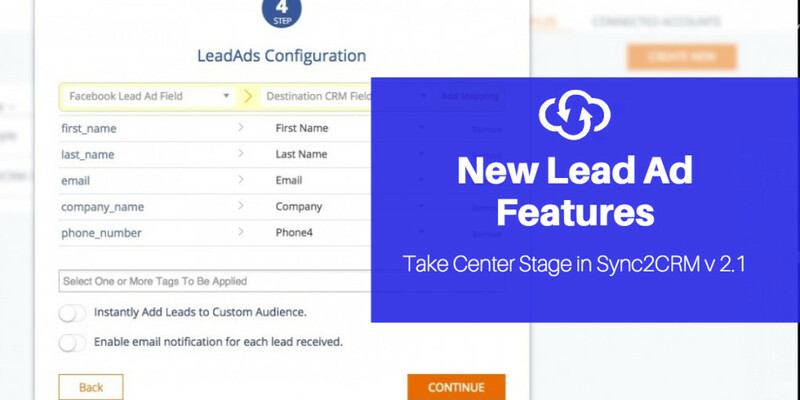 – When you connect a new Lead Ad, you can select one or more of your Facebook Custom Audiences and the new lead is instantly synced to the custom audience so you can BEGIN SHOWING THEM ADS IMMEDIATELY, based on where they are in the funnel. – We have changed the sync interval to 1 hour from 3 hours on Facebook Custom Audiences. This is important for customers with BIG CAMPAIGNS IN TIGHT TIMEFRAMES, like a launch, for example. – We have improved fault tolerance for Infusionsoft network errors. This has reduced the number of failed syncs by about 80%. We continue to work on tracking down other causes and eradicating them but this was a big one. – We have made some changes to the user interface (UI) to make it a smoother, more intuitive experience. – We have resolved various and sundry bugs that were reported after the release of Version 2.0. We recently passed the 2 million contacts per day synced to Facebook custom audiences mark. And within a week, almost had a 3 million contact day (it was 2.9 million … so close!. We have put a lot of time and money into building a stable platform, with state of the art architecture, that can support your business in MISSION CRITICAL CAMPAIGNS such as massive launches. This isn’t just something we threw together on a $20/month server. Stay tuned because our Active Campaign and MailChimp integrations will be out next. And there is lots more to come! If you are not already a Sync2CRM Insider, opt-in to our email list so you will receive tips, tricks and ideas to help you use your CRM with Facebook in creative ways to get more leads, improve conversions, reduce ad costs, scale campaigns automatically and banish CSV files forever. If you have any thoughts, questions or comments on this release or future functionality, please feel free to either leave them in the comments below, on our Facebook Page or in the blue chat button on the bottom right hand side of every page. I read and respond to every comment and would love to hear from you.